The Nebula Awards were announced this weekend, and the winner of the Andre Norton Award (for which Graceling was a finalist) is Ysabeau S. Wilce's Flora's Dare: How a Girl of Spirit Gambles All to Expand Her Vocabulary, etc., etc. Congrats to Wilce! I haven't read any Flora books yet, but they're at the top of my list. I know from talk among my friends that the SFWA made an excellent choice. :o) All the 2008 Nebula winners are here. The Graveyard Book has been named the ABA's Best Indie Young Adult Buzz Book of the year. It's also the book I read over the weekend. It made me happy; it's beautifully written and beautifully simple, and creepy and sad. Congrats to Neil Gaiman. 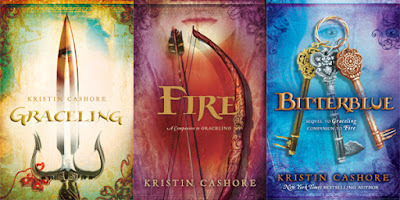 Graceling was named an honor book in the same category, and all the 2008 Indies Choice Book Award winners can be found by poking around here. So, I announce a lot of happy things here on my blog -- but there's something I've been wanting to express about publishing and thrills, buzz, news, reviews, new deals, hip-hip-hooray, and all that stuff. I've started a gazillion posts about it, actually, and then abandoned them, because I can't get the words right. One more thing about publication: when this book of mine came out, the one that did pretty well, the one that necessitated the buying of a new dress, I found myself stoned on all the attention, and then lost and derailed, needing a new fix every couple of days and otherwise going into withdrawal. My insides became completely uninhabitable, as if I'd wandered into a penny arcade with lots of bells ringing and lights flashing and lots of junk food, and I'd been there too long. I wanted peace, peace and quiet, but at the same time I didn't want to leave. I was like one of the bad boys in "Pinocchio" who flock to the island of pleasure and grow donkey ears. I knew my soul was sick and that I needed spiritual advice, and I knew also that this advice shouldn't be terribly sophisticated. So I went to see the pastor of my son's preschool. The pastor is about fifteen. We talked for a while. It turns out he just looks young. I said that I was all over the place, up and down, scattered, high, withdrawing, lost, and in the midst of it all trying to find some elusive sense of serenity. "The world can't give that serenity," he said. "The world can't give us peace. We can only find it in our hearts." "I hate that," I said. "I know. But the good news is that by the same token, the world can't take it away." All that I know about the relationship between publication and mental health was summed up in one line of the movie Cool Runnings, which is about the first Jamaican bobsled team.... The men on [the] team are desperate to win an Olympic medal.... But the coach says, "If you're not enough before the gold medal, you won't be enough with it." Here's more about Anne Lamott. Her Bird by Bird is one of very few books on writing that I adore. Kristin, I feel lost. I've been writing the same novel all year and suddenly as if lightening had struck me I gave it to my English teacher who liked it alot...From that day on I disliked the book...I disliked it because she liked it? Or was it because she corrected some of it when I thought it was perfect and that shamed me? What do I do? Do I take a break from it or abandon it? I have started writing a new book that I like much better. I've also realized something else...I can't write a novel with 40,000 words. It shames me. My mom says I should just write short stories and make it into a book of 3 short books. Would that be wise? I'm really young but full of amibition. Can you help me? Your writing is your gift to us, your Grace, :) that YOU share with US. It comes from inside you, from your heartspring. That heartspring is the gateway between your inner sanctum and the outside world. You can dip from your heartspring and use that to weave stories and characters and worlds for us to enjoy. How much you dip is YOUR choice. Another thing. We love you. :) We love the things that come from your heartspring. This does not mean that we all own shares of Kristin. You own you, no matter how much the public loves you, how much your friends love you, or how much your family loves you. You own you. And no one can pass through your heartspring into your inner sanctum unless you let them. And finally. DO NOT ALLOW ANYONE TO BULLY YOU. You are successful, and many people have probably helped you reach that success. That doesn't give them a bill of sale on you. Being grateful and gracious are very different from 'owing your soul' to someone and thusly feeling that you must do whatever they want regardless of how you actually feel about the matter. It's okay to say no. If people don't understand that, or at least trust that no is the best thing for you at that time, then they aren't interested in you so much as the end result. Okay, I think I've nattered enough for now, hope I haven't scared you with my aggressive opinions. I've just seen so many forests cut down to make subdivisions so that people could 'live in the woods'. If you really love something, and appreciate it, you let it be what it is, instead of trying to prefect it until it is nothing like it was. Oh, and Jen, I'm not Kristin :) but I'm an aspiring writer, and as such, I understand what you feel. Sometimes, you outgrow a story. I have dozens that are partially finished. Sometimes you write something because you can't stand to hold it in, but it's 'destiny' isn't to become the next best seller, but to teach you about your own skills. As for writing a novel with 40,000 words. I can't write one with less than 180,000. Each person is different. I just write until the story is written, then I work on trimming. I can't believe you wrote something from Bird by Bird. When I started getting into writing, that's one of the first books my teacher recommended. It's my bible whenever I get lost in the maze of words. My favorite part is about Mel Brooks and The Broccoli. And you're absolutely right, love is the only thing that cannot be taken away because it comes from within. And you have to write as if you're never going to be published. That takes a lot of pressure away, doesn't it? Thank you for a most wonderful post!Happy peaceful Monday to you too! I've read almost everything she has written, and it often happens that her words are just what I need at that precise moment. Even though my life has been nothing like hers, she has the gift of speaking right to me and, I think, to everyone. I wish I could face my struggles with as much humor, grace, and faith as she does. Thanks for reminding me of this amazing book, Kristin. Best of luck to you as you seek your own little pocket of serenity. The sun is shining and you still have time before you move (I think?) so you can always go down to see the birds. They love you no matter what. Or maybe they are just indifferent? Either way - no pressure! Let time slow you down instead of rushing you. And if all else fails, go find a cupcake bakery and get you a cupcake w/peanut-butter butter cream! I had to give in to the fix this weekend! I am sending you a great big bear hug. We love you and you are awesome. Just got your book back from another friend who'd borrowed it and LOVED it! I'm not a writer (which is why I'm using the quotes) - it's a gift I envy in others - and I can't imagine the kind of life you've been thrust into. Whether by fate or by choice, enjoy the ride and find your peace. I won an uncopyedited version of Fire from a blog giveaway and I'm reading it right now and it like I'm not even reading. Its like a story is just forming in my mind, complete and whole and just exactly the way it should be and I can't help but thank you for writing just the way I think, because it takes your stories to a whole other level for me and I love living in them! Well, Artemis, Avery, Shannon, Alissa, Angie, and Sarah, I have to say a special thanks today for these comments. You have all helped me find the serenity I'm looking for! Thank you for being so kind. Artemis, you outdid yourself. Thank you. Jen, I second what A. Grey said! Make sure to be gentle with yourself, you know? It's okay to let a project go if it's not where your heart is right now -- it'll still be there if and when you're ever ready to go back to it. And short stories and/or novellas are amazing art forms! There's nothing wrong with short books! I wish I knew how to write one! :o) Seriously, though. I've tried to force myself to work on a certain book when my heart wasn't in it. It doesn't work. It just burns you out. One of the hardest things for a person with ambition is to learn to let yourself rest and let things go. Be gentle with yourself. It sounds like you're doing all the right things! Thanks so much:D :-o I saw a person who looked like you at the mall in front of my favorite book store like a month ago...oh and does this make a good sentence? The Earth was covered with small whirly white snow that fell like sheets against the once lively ground. I liked it but I don't so before I delete it is it okay? Jen, glad my wordy words helped you! Kristin is very right in what she said about the hardest part being learning to let yourself rest and let things go. That's one reason I'm so defensive over people who have obtained success. If you have a talent, I've found, people are often wont use guilt to try and force you to produce or utilized said talent. They might not do so out of greed or ill-intent but they don't understand how it hurts. There is nothing wrong with letting a story pass through you, or leaving a painting unfinished. It's like making your bed. I never make my bed. Somehow, making my bed disturbes the dreams I've left unfinished and I can never find them again. If I leave the blankets messy, when I go to sleep, I pick up where I left off. So, I can see not only one, but TWO new posts by Kristin on my dashboard, but when I click on them the screen tells me that the pages don't exist on Kristin's blog, and when I go to her blog, they aren't there. Someone please direct me on the matter. Yeah, that's my bad. I was fiddling around yesterday, trying to figure out what happens when you move the dates of posts, and accidentally posted two posts that weren't meant to post yet. Oops! AG, just so I know the havoc I wreaked, can you read the whole posts, or just see the titles or something?